Blu-ray Review: Teen Titans GO to the Movies! The Teen Titans come face to face with Slaaaaaaaaaade….. Coincidentally, we first stumbled upon Teen Titans GO when they were doing a special on Cartoon Network promoting the release of their new movie… this movie, Teen Titans GO to the Movies! Turns out we enjoyed the show — a far cry from the much more serious Teen Titans show we’d seen years prior — and found ourselves interested in checking it out. In a world where every superhero gets his own movie, one person is feeling left out, Robin. The leader of the Teen Titans believes the only way to legitimize himself and the team is to get their own film franchise. His dreams look like they’re about to be realized during a Batman screening as trailers for spin-offs are shown, but when Robin celebrates prematurely he ends up getting laughed out of the theater. As a group, the Titans — Robin, Cyborg, Beast Boy, Raven and Starfire — decide that what they need to be taken seriously is an arch-nemesis. Enter Slade (Will Arnett), a Deadpool ripoff that they encounter as he tries to steal a crystal from S.T.A.R. Labs. They’re eventually able to stop him, and that gives them the boost they need to get famed superhero director Jade Wilson (Kristen Bell) to make a movie about them. Things don’t go smoothly out in Hollywood, however, with the other Titans destroying a sinister-looking but theoretically innocent satellite for a streaming service while Robin is being given a tour of the premises. After that, Wilson fires the Titans and proposes a solo project entitled Robin: The Movie, which Robin accepts much to the team’s dismay. With his friends gone, will Robin finally get the recognition he covets or are dark forces at work here? 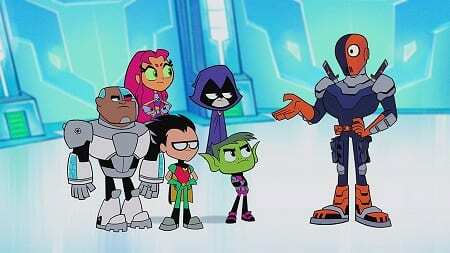 There are inherent concerns with taking a short, fast-paced cartoon and stretching it into a feature-length film (even if it is on the short side at around 80 minutes), but Teen Titans GO holds up from start to finish. The pacing is brisk without being manic, and there are a number of scenes and musical numbers that are laugh-out loud funny. Part of the film’s charm is putting serious characters in ridiculous situations, and it does so to great effect. Watching the Titans ride big wheels to travel back through time to prevent origin stories from happening is probably the highlight of that approach whether they’re fixing Krypton or guiding the Wayne family through a safer part of town. Taking a new, silly twist on stories we’re all familiar with was a great idea. As a parent, one of things I really appreciated was that this was something we could watch together that wasn’t Pixar or Disney, and in that way it felt really fresh. Its meta-humour about the proliferation of superhero films is an easy target, but it’s still well done. And does anyone have a better voice for animation than Will Arnett? He’s perfect as Slaaaaaaaade. While this won’t go down as an animated classic, it understands what it is and what it wants to be, and we don’t have much to complain about. The animation style is a little rough, but that’s part and parcel to the show so it didn’t need to be changed. It leans into the potty humour at times, which may bother parents of younger children, but we were OK with that, too. Although there are quite a few extras, none of them are very long or interesting. An animated short about Bat Girl is probably the best, and there’s an extra song that wasn’t in the movie, though it lasts less than a minute and is only storyboards. A couple of sing-alongs might be fun for kids, while a handful of snippets translated in multiple languages is worth a chuckle. Fast paced, colourful and legitimately funny, Teen Titans GO to the Movies! is well worth your time whether you’re an existing fan of the series or not. This entry was posted on Wednesday, November 7th, 2018 at 1:50 am	and is filed under Herija Green, Movie Reviews. You can follow any responses to this entry through the RSS 2.0 feed. Both comments and pings are currently closed.